Clusters of berries, verdant branches of pines and conifers, and, of course, the holly and the ivy. This is Christmas decorating at its best. It’s incredbly satisfying, as every dog walk or park visit becomes a hunt for fallen treasure, and you search for the perfect branch to take home and transform. And even better, it’s free. If you don’t have a garden, your local park or wood will offer up plenty of material. You shouldn’t take plants from sites of scientific interest, nature reserves or private property – although I don’t think anyone would begrudge a few fallen leaves or branches. If you’re in doubt, ask permission first. And remember that all of these branches and berries, leaves and seedheads, are shelter and food for our wildlife. Don’t strip the woodland bare, and be sure you leave enough for those that rely on it to get through winter. Making your own wreath is pleasingly simple and hugely satisfying. The trick is not to end up making a mountain of them because once you’ve made the first one down it’s hard not to get addicted and think every door needs one. 1. First, make a base. The best rings are made from willow or dogwood, but any supple young growth that can be woven together and held with string will do. You’ll need three to five supple shoots, each around a metre in length. 2. Using your knee, bend the shoots to start to form a circle. You shouldn’t need string with willow or dogwood, just wrap the shoot around itself. 3. Then, moving round slightly from where you started, tuck the next shoot in, wrapping it round as you go for strength. Add more shoots as you see fit, but don’t pull the wreath too tight or you won’t be able to tuck the decorations in. 4. Once you’ve got a suitably sized ring, go to your garden or along a hedgerow and pick out anything that pleases you to use as decoration. Dried flowers, seedheads, rosemary, sage, bay leaves and other sweet-smelling evergreen herbs work well. You could use rosehips, holly berries, crab apples, some go for cinnamon quills or chillies, or you could do something fancy with dried citrus peel. 5. 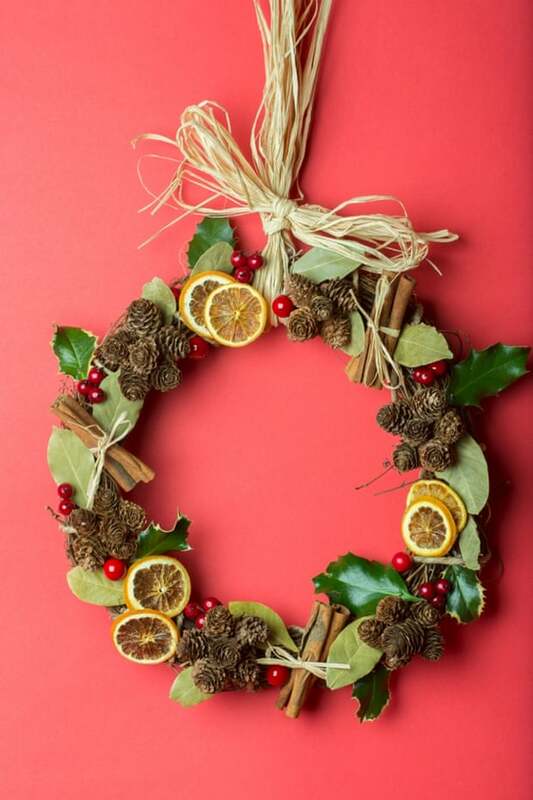 Build up the greenery – holly, ivy, pine needles etc – and then add the flowers/fruit/seedheads, poking the stems into your woven wooden wreath base. Imagine a clock face – 12, 3, 6 and 9 o’clock – as a guide and then build up from there. Either agree that less is more, or throw all the rules out and freestyle – but be bold and generous. Nothing looks sadder than a thin Christmas wreath on a door. 6. You’ll need to hang up your wreath with raffia, a ribbon bow or a hidden wire loop at the back. Just remember it needs to be strong enough to take the door swinging back and forth. I have a thing for lichen-covered branches: I am forever collecting them up at the allotment. A large filled vase is most pleasing, perhaps with fairy lights or, if the branches are large enough, with hanging tea-light holders. You could even put a bird on it. Etsy has endless bird garlands to be woven through. If lichen isn’t your thing, then colourful stems of dogwood or willow, the contrast of eucalyptus, the bright green stems of Kerria japonica, a few twigs of the snowberry (that front garden favourite with big white berries), Symphoricarpos albus. I even like small-leaved lime, Tilia cordata, at this time of year, when the stem tips go a slight orange colour. The trick here is to embrace the starkness of a leafless branch, so allow enough space for each stem to be viewed. 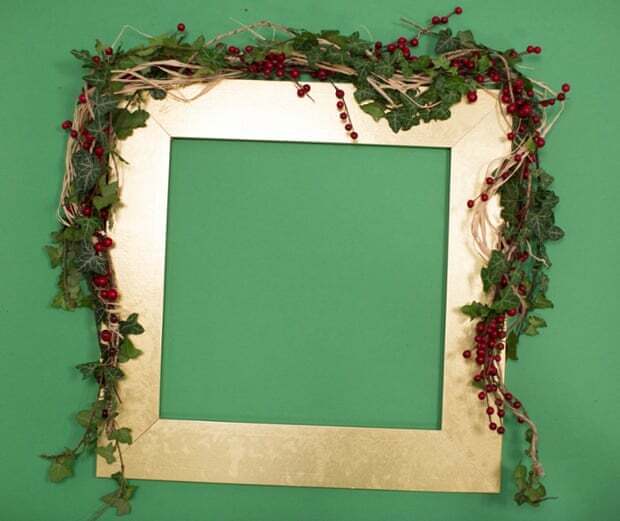 The simplest garland to loop along mantelpieces or above mirrors and pictures is lengths of ivy and other evergreen foliage twisted together to create a sort of swag. Method: Create a single line of greenery, joining various pieces if necessary, so that you have a line around 2 metres long. You may find that you need to tie various pieces in – florist’s wire is excellent for this. Then make another two lines and twist them together, as you would do to make a rope: do this gently so that it doesn’t look too forced and now you have your base. The purist may want to keep just to ivy; the more whimsical may want to add in fairy lights. I personally love old man’s beard, Clematis vitalba, seedheads woven in amongst the green. Dried hydrangea flowers or sprayed seed heads work well too. You can make a table version using pine and conifer bough, interspersed with pinecones or candles, if you like. I’d advise against these for on top of pictures or mirrors as they weigh more than they appear. 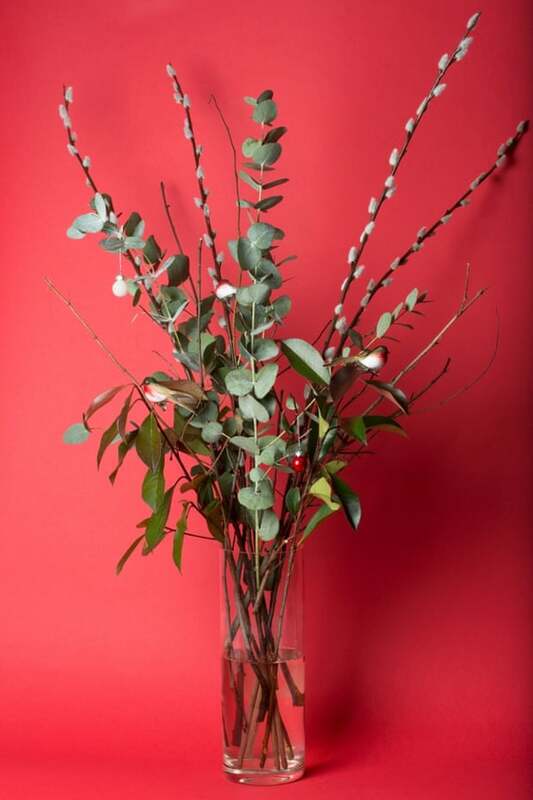 If, however, a big swag of garland is too much, then find the prettiest autumn leaves, dainty seedheads, Chinese lanterns and rosehips, and string them a few centimetres apart along some thin wire or cotton. A little repetition can be nice. I’ve seen lovely ones made with just rosehips alone, whatever takes your fancy here as long as it’s done tidily. These delicate garlands look lovely over the fireplace, catching light along a windowpane or edge of a sill. I love pinecones, so pleasing at all stages, either open or closed. If you want them to open, place them on top of a radiator or a gentle heat source and after a day or so, they should pop. I prefer my pinecones plain, but clearly they are made for glitter, glue and sprinkles, so do as you see fit. String these at regular intervals along some pretty twine or ribbon. These look as good hung vertically as they do horizontally.